Congressman John Conyers has a storied legacy that was threatened by the campaign staff’s signature problems. He has now overcome that problem (a federal judge has now ruled to put him back on the ballot). What is important is to recognize that his legacy is not just in the past. It’s true that Conyers created the Martin Luther King Day, was an original founder of the Congressional Black Caucus, was a key member of the Judiciary Committee voting to impeach Richard Nixon and recently to protect Bill Clinton from impeachment, and authored hate crimes and voting rights legislation. In March 1994, renowned newspaperman Jack Anderson, who normally blasted his subjects, headlined a biographical column, “John Conyers: Persistence and Power”. However, anyone who thinks Conyers’ time has passed has not run around with him on his still frenetic schedule of meetings and actions. He is as effective as ever and still runs the meetings with precise organization and energy driving to further action. Conyers said this week, “My most important bill is the Full Employment Act,” and he convenes weekly meetings in his office with national and Detroit leaders on strategies to increase jobs by legislation, executive action, and pushes in the media. He is trying to “show we don’t want to be the Congress that blocks jobs.” He is asking members of Congress to co-sponsor HR 1000, his legislation, the Full Employment Act, and he has a hefty 57 co-sponsors so far. He is aiming at over 100. “The failure of the Congress to focus on jobs is not just a political blunder. It’s a dereliction of duty and has caused real human suffering,” he said. Three years ago, the House leadership refused to allow a vote on the American Jobs Act, the President’s legislation that CBO said would create a million jobs and drop the unemployment rate by a full point. Now, the President has proposed an infrastructure program once again that could lead to a million new jobs. Once again, the House leadership will not allow a vote. However, Conyers is offering members a chance to show they are on record for jobs. His HR 1000 aims at 4% unemployment or less (what is defined as full employment) and provides job training as well. The House leadership can stop members’ votes, but they cannot stop their co-sponsorships. It’s a way to get on record. Conyers is contacting Members of Congress because, as he says, “building sponsors is absolutely critical.” Creating real jobs—not tax breaks for the rich, not deregulation for big corporations — is the best way to build job numbers and reduce the unemployment rate. That’s what the Library of Congress said, but senators with big business interests attempted to block that report. The Library of Congress division head released it anyway because he knows that knowledge is power, not ignoring the truth. Conyers wants to create good jobs for women, to allow women’s empowerment; to create good jobs for young people and students, because we know that students with big student loan debt don’t want a free lunch – they want to pay off their loans by working. He wants to create good jobs for minorities and Native Americans, because they suffer disproportionately from the poverty generated by unemployment. He wants to create and protect good jobs for seniors, because many want to work longer as they remain healthier and are determined not to become a burden on their families. And he wants to create jobs to improve our infrastructure, because as many as 40% of roads, bridges, and tunnels are dying, the U.S. is no longer the world’s number one transportation leader, and we want to stay competitive. For all those reasons and more, he not only introduced HR 1000 but also created the congressional Full Employment Caucus, which he chairs. He is using other tools at his disposal also—urging the Federal Reserve to act on the hidden part of its mandate… it is supposed not only to address inflation, but to generate “maximum employment.” It is a two-part mandate, and Conyers recently sent a letter to the new “Fed” Chair, Janet Yellen, urging her to address the “maximum employment” part of the equation, not just help big corporations with bailout loans. The Fed gave 17 TRILLION dollars in loans and grants to big corporations and banks during the 2008 economic crash—without strings. Then-Speaker Pelosi said in retrospect she wishes Congress had attached strings to create jobs, not just restore profits. So now, Conyers wants the Fed to infuse money, as they have the right to do—whether a trillion dollars or more, into the economy, to companies, but WITH the “string” that it should be used to create jobs. Yellen’s last news conference acknowledged this priority of the Fed’s role to create jobs. 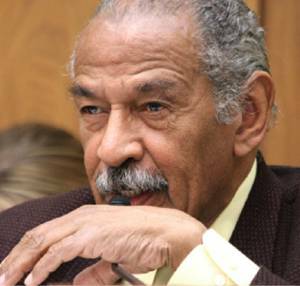 Conyers made a difference – and he told us he feels good about that. It’s clear: John Conyers not only has a phenomenal legacy, but is looking to the future. Weiner writes about the White House for the Chronicle. He was a Clinton White House spokesman, senior staff for Congressmen Conyers, Rangel, Pepper, Koch, and Senator Kennedy, and wrote the epilogue to Bankole Thompson’s groundbreaking book, Obama and Christian Loyalty.